Mediation Service is a statutory public service in Norway for parents with children under 16, who are going through a break up. The service was established to ensure that the needs of the children were met during and after a divorce. Bufdir, The Norwegian Directorate for Children, Youth and Family Affairs, offers the service through its 49 regional family counselling centres through out Norway. The service helps parents make visitation agreements and find a common agreement on other matters concerning the children, always with the children’s best interest in mind. The mediation is free of charge and is usually takes place at a family counselling centres, where both parents participate. The aim of the service is to help parents agree on the best possible arrangements for childcare, custody and visitation by designing an end solution based on the needs of the children. On account of earlier surveys regarding family counselling, Bufdir wanted to pursue opportunities for innovation and improvement. Findings concluded that there were geographical and professional differences among Norwegian mediation services, and that family counselling tasks had increased in complexity as a result of more diverse user groups. Therefore, the intention was to create an improved, user centric and holistic mediation service to the best of the children’s interest. By applying service design methods such as user involvement and co-creation with representatives from Bufdir, EGGS was able to help reveal areas of improvement. In addition we focused on increasing the expertise and competency about service design within Bufdir. This included increasing the expertise and competency about service design within Bufdir by highlighting how the methods can contribute as tools to upgrade Bufdir’s services. We conducted a series of interviews with parents and children throughout the various stages of mediation, interviews with family counselling mediators, observation of parental mediation, and other miscellaneous sources. This proved to be highly informative in terms of having empathy and a profound understanding of users needs, and their experiences of mediation services. Most importantly we learned that different parents have different needs, we therefore strived to design a service that caters for every individual case. The concept is illustrated step by step ideas for each contact point, displaying digital and mediator tools along with information to parents and children. Guidelines were also developed providing general user-orientated policies. The creative process led to a more comprehensive concept for the future of mediation services. The basis for the new concept was to differentiate and offer a customised mediation service. This is illustrated by an overall concept with three different scenarios. Scenario A is straight forward mediation for parents with levels of conflict, and where the couples manage to communicate to find a solution. Scenario B is for more complex situations, where the level of conflict is higher or the parents have some unresolved issues, making collaboration more challenging. In Scenario C the conflict has escalated deadlock, making communication difficult and where the divorce case is being considered to be dealt with in the courts. 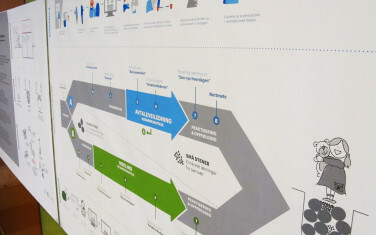 In the wake of this pilot service design project, 3 development projects have been initiated. Summed up, these 3 development projects combined is the new mediation service. The new mediation service offers parents the option of going online at home to start the process of finding an agreement as well as to help get information when preparing for any upcoming family counselling. All projects have been supported at a top level in Bufdir and are part of a major on-going digitalisation plan for the directorate. The entire process is a co–creation between the directorate, mediators, child welfare officers, staff and end-users. This has led to a changing of mind-sets and what best to focus on for the users, as well as a redirection of human resources to those who need them the most. This film is made by the Norwegian Center for Design and Architecture. It is in Norwegian. This film is about the pilot service design project for the Mediation Service (2013). Different users from the different aspects of the value chain were involved creating new insights that contributed to improving user experiences, efficient use of resources and creating a more rational mediation service. Service industries account for almost 80% of employment in Norway.